Famous people born on DECEMBER 19 are Sagittarius who get a thrill out of being noticed. They have a certain appeal that is magnetic and quite bewitching. As a youthful individual they are cheerful and humorous. At the same time, people say that they are a geek or nerd who is on top of his or her game. Anyone would be lucky to have them on their team. As a lover, they can sometimes spread themselves a little to thin. This risky behavior could mean the loss of someone special if they are not careful. If they are looking to settle down with the personality born on this day, they should be aware that he or she loves to do things on the spur of the moment. So they should be willing to drop everything they are doing and have some fun! Famous December 19 celebrities should not forget to take their vitamins and eat right. They’ll need them to keep up with this Sagittarius. 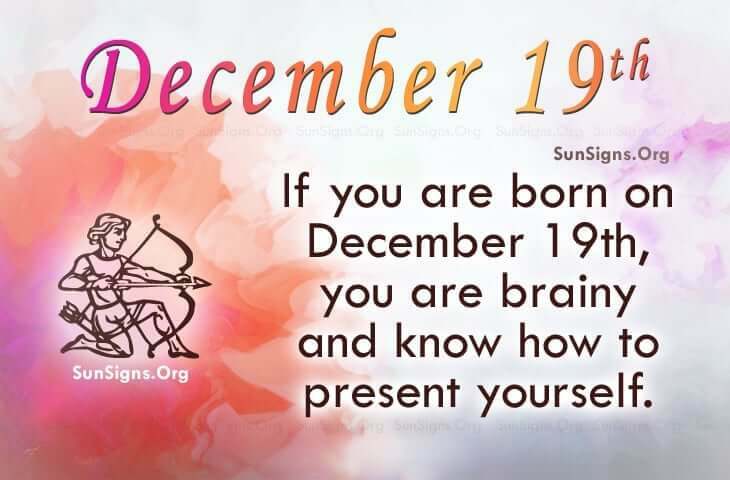 Famous people born on DECEMBER 19th are likely to be very successful. They are a strong and talented Sagittarius who is the envy of the town. They are dedicated to having a comfortable lifestyle. Having the skills and knowledge necessary to advance, they also know how to present themselves in a diverse group.